Have you ever wondered what’s inside Kirkland puppy food? Maybe you’ve spotted the particularly bright-colored bags of the Nature’s Domain range and wondered…is that something my dog might like? We have, too, and we thought it was about time to do some Kirkland dog food reviews to help you answer those questions. Compared to some other kibble brands, Kirkland doesn’t tend to advertise as much. That is, where other companies are quick to point out their benefits for your pooch, you might find yourself searching a little harder for the lowdown on Kirkland. So, we’ve done that for you. We’ve looked at all the ingredients in each packet reviewed, dug into the ‘who’ and the ‘where’, and even done a bunch of math to calculate different things like calcium content. All to save you time. So let’s dive in! 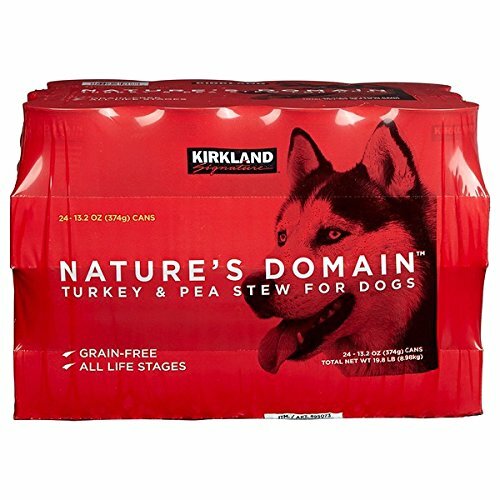 Why the Kirkland Puppy Food Reviews and Kirkland Dog Food Reviews? What is the AAFCO all about? Who are they? How come there’s canola oil in some Kirkland dog foods? Also known as Costco Kirkland, or by their official name — Kirkland Signature — you may have started seeing this brand around a bit more in recent years. If you’ve also checked out our Diamond Dog Food Review, you’ll know that Diamond packages and creates pet foods for different brands. Kirkland is one of those brands. That means it’s owned by the same manufacturers (Schell & Kampeter) that have been creating Diamond food for close to half a century. The plants themselves are in the USA — South Carolina, Missouri, and California to be precise. You will, most likely, have noticed both the wet and dry dog foods on sale in Costco. Now, however, you can order Kirkland in the comfort of your home, for a whole range of different doggy shapes and sizes! Kirkland Signature Nature’s Domain, which includes grain-free (and thus gluten-free) kibbles for puppies and grown dogs. 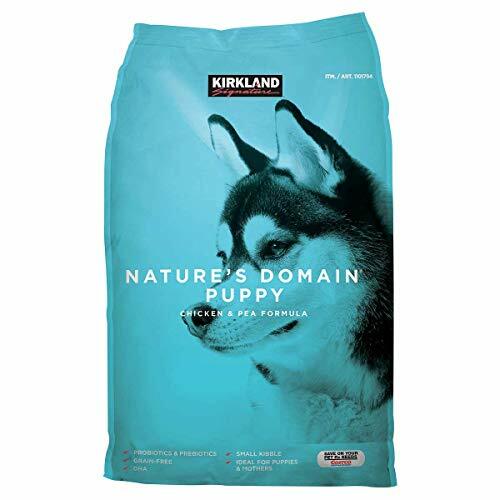 While Kirkland doesn’t actually manufacture a special hypoallergenic pet food for dogs, there is quite a selection of different flavors in the Nature’s Domain range. As a brand, Kirkland doesn’t quite offer the huge array of flavors as some other brands quite yet, but we’re pretty sure that could change in the near future. 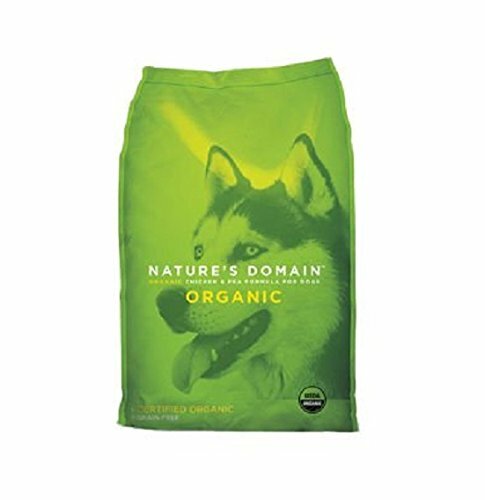 In the meantime, owners can pick up a weight management formula for those dogs on a diet, and even an organic blend. So, not your average ‘supermarket’ brand in the bad sense — instead, it’s affordable, high-quality food from a producer with a good reputation. All in all, Kirkland Signature is popular with consumers and there aren’t a great deal of Kirkland dog food recalls to report. During 2007, the FDA reports, we saw some Kirkland dog food recalled due to potential melamine contaminations. 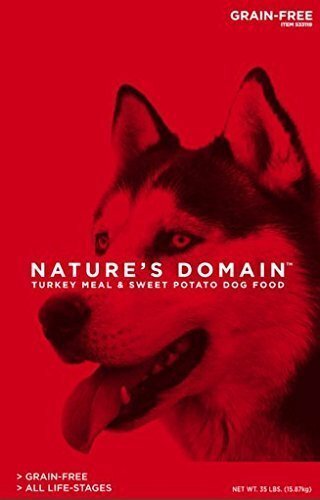 Five years after that in 2012, some Super Premium and one Nature’s Domain products were recalled when Diamond Dog Food voluntarily took some of its offerings off the shelves. To read more about this 2012 recall, check out our Diamond Dog Food Reviews. They offer a unique proprietary culture of probiotics that makes digestion that little bit easier for dogs. As owners, we’ve got a few more reasons to add! They seem to taste pretty nice, according to our pets. We’ve started with Kirkland’s organic dinner from their Nature’s Domain range. Then, choices for your smaller breed pup, and a nice All Life Stages option. All-organic chicken takes a top spot in this particular Nature’s Domain ingredients list. Totally grain-free, but with all the yummy fiber of sweet potatoes and chickpeas. Healthy, wholesome, and delicious for adult dogs! It’s safe for gluten-intolerant pooches! Here’s an ideal pea and chicken blend for adult dogs, and it includes zinc to combat deficiencies and protect against infections. Plus it’s organic, and we love that! Salmon’s got a heap of great benefits for dogs both big and small — this formula’s for Yorkies, Chihuahuas, Corgis, and other small pooches. It’s simple to break down and digest, so it’s easy on small tummies! Nope, it’s a great mix of meat-and non-meat proteins with a delectable salmon flavor for little dogs! As a protein and as a source of healthy fish oil, salmon’s a mouth-watering and wholesome addition to any meal. And in this recipe, it’s the star ingredient. This is formulated especially to meet those high-energy needs of our smaller grown dogs. Totally without any wheat or corn — it’s an entirely zero-grain formula. This sweet potato and turkey kibble contains antioxidants and prebiotics to help your puppy, grown, or senior dog stays healthy and happy. That’s coupled with Vitamin E for healthy doggy skin — your dog’s first layer of defense against disease! Also includes natural vitamins from fruits like blueberries and veggies like peas and sweet potatoes. For puppies, 24% may be a slightly low protein figure. We like that salmon oil in this blend offers DHA and glucosamine for dogs of all sizes. While it’s already reasonably priced, we also think it’s cool that one recipe can feed all the doggy members of our family. Super if you’ve got several fluffy best friends. Kirkland has only two puppy-specific formulas, at present, but it’s worth noting that several other Kirkland Signature dog foods are designed for All Life Stages. 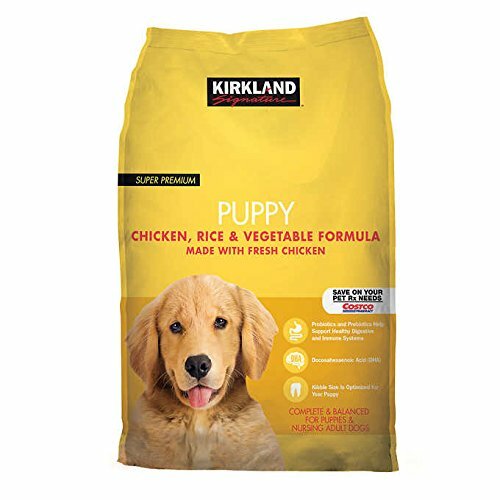 Kirkland Signature Expect More Puppy Formula Chicken, Rice and Vegetable Dog Food 20 lb. First of all, what a great price for a 20lb bag of puppy kibble. Second, this is supplemented with healthy probiotic bacteria for those of us owners who’ve got pups with sensitive tummies. This chicken, veggie, and rice blend is made especially for our growing little ones. First top ingredients in here are chicken and…chicken meal! Provides Vitamin E that assists the protection of your pup’s skin. Contains potatoes, which owners of intolerant pets should note. There is a good 28% of protein in this bag, with 17% fat — both great figures for most puppy breeds. 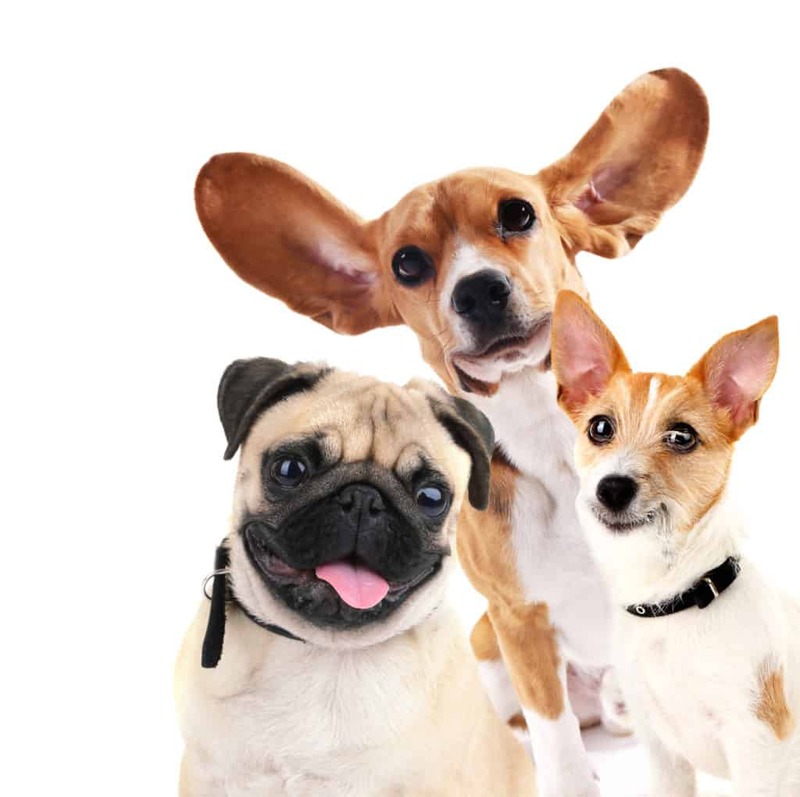 It doesn’t seem to specify on the packaging whether this includes large breed pups, but it contains a suitable calcium to phosphorus ratio which is within the AAFCO’s guidelines for large puppy breeds. Here’s a similar flavor, but this time with zero rice or grains. It’s also suitable for lactating and gestating (pregnant) dogs. Also free of any wheat, maize, and soy. Some puppy owners might prefer a food with higher protein — although, 27% is usually fine for larger breeds. Of course, this is a great option for gluten-intolerant puppies. With 340 k/Cal per cup and good-quality protein used, it’s even got a smaller kibble that makes it easier to bite and chew. 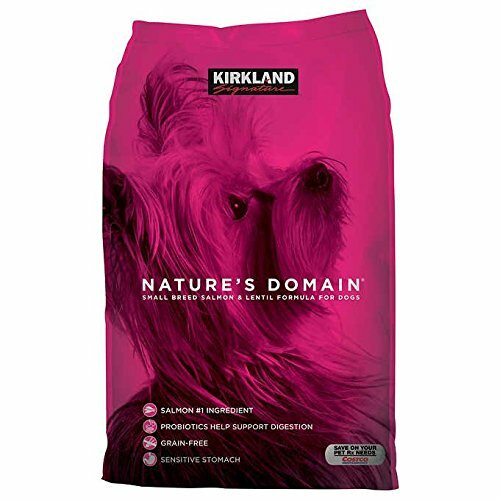 There aren’t too many wet Kirkland dog foods, but here’s a lovely one that all dog ages and sizes can enjoy. Judging from what we’ve seen so far, we hope they release more in the near future! It makes great senior dog food. This is somewhat watery, as wet dog foods go. However, these are some healthy ingredients and it features fruit and veg as well as protein. Nice! Older dogs and recently-weaned puppies will love the taste of tender turkey chunks, plus it’s easy for them to eat. Note that customers have found some of these cans to be slightly watery, and were expecting more chunky, thick wet food than they found on opening it. 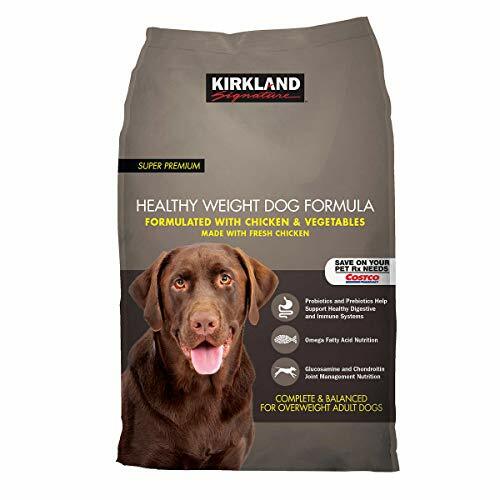 Kirkland doesn’t create specialized hypoallergenic dog food (yet, at least). However, we’ve reviewed the weight management option for those doggies on a diet! At only 275 k/Cal per cup, this formula is developed especially to help reduce the risk of obesity or further weight gain in adult dogs. Contains glucosamine and also healthy chondroitin to keep those hips and joints in good shape! Offers zinc and Omega acids to protect your dog’s skin. This isn’t grain-free as it includes rice and oatmeal. If you’ve got a gluten-intolerant pooch, they’ll need to be eating a different formula. However, this contains oatmeal and probiotic cultures, which are good for digestion. Calorie-controlled to help your dog keep at a healthy weight. AAFCO is an acronym for ‘Association of American Feed Control Officials’. They are a volunteer group of government agencies that began in 1901 to regulate pet food distribution and sale. The AAFCO doesn’t carry out any inspections or regulate dog food itself, but it draws out standards on nutrition. Examples include AAFCO nutrient profiles for what is considered a puppy food, and for All Life Stages food. 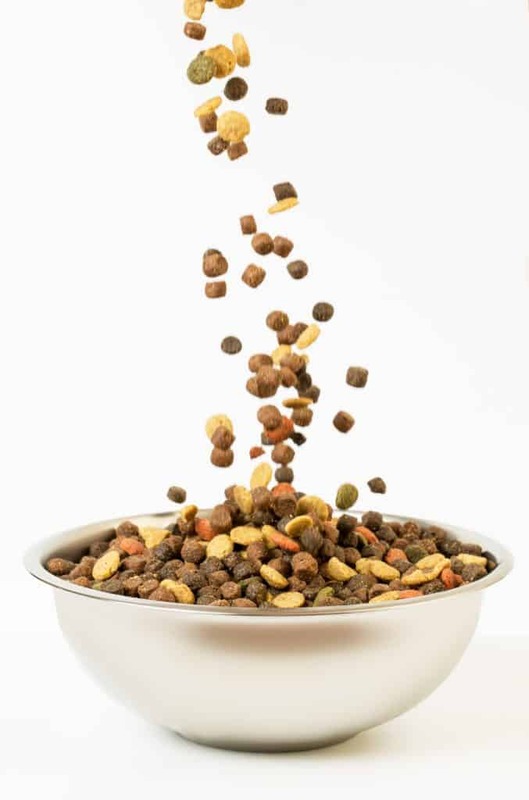 If a dog food manufacturer wishes to label its food as providing ‘balanced and complete nutrition for growth and development’, for instance, it must meet AAFCO requirements before it can receive approval from them. Generally, these will consider things like minimum protein and an adequate proportion of calcium to phosphorus. Canola oil is usually included in dog foods because it is a source of both calories and fat. It also provides your pooch with Omega 3 acids. Canines aren’t able to make Omega 3 acids themselves, so they need to get it from their diets. One commonly known Omega 3 acid is DHA, although it should be known that canola oil doesn’t include DHA. Rather, it includes ALA, which dogs can then turn into DHA (although not super effectively). So, in short, canola oil is usually added to kibbles like Kirkland dog food for fat and calories. If you’re looking specifically for something that includes DHA for your dog, one more effective source is salmon oil.